Cooking great tasting steaks depend on a lot of things. For one, the cut and quality of meat should be good. You will also need to consider the marinade before cooking. Lastly, you need to cook your steak perfectly, regardless of what level of cooking is preferred. Often, steaks are cooked on grills. These sorts of steaks make some of the best-tasting ones. You can also pan-fry streaks if you don’t have a grill. When you’re ready to grill or fry the steaks, ask each diner how they like their steaks and cook accordingly. Warning: It is best to put in your steaks only when grill or oven temperature reaches optimum required heat. Warning: Be sure to cook in small batches only. Do not cover the entire grill with steaks to efficiently cook each steak with enough heat. Warning: The amount of juice depends on the level of doneness that you want. Remember that you need to make sure that both sides of the steaks are cooked, even when the insides remain rare. Bacteria develop in the exposed sides of beef. Warning: A nicely cooked rare steak only takes a few minutes on each side, and you turn them only once. The meat should feel very soft when you poke it with your tongs. The thermometer should read 140 degrees F, the right temperature of done rare steak. Remember to not let the thermometer touch the bone. This gives out an inaccurate temperature reading. Warning: You need to cook the steaks until the juices surface to the top. The meat thermometer should read 145 degrees F.
Warning: These steaks should feel firm when poked by your tongs. At the same time, the thermometer should read 170 degress F.
Whether you cook steaks rare, medium rare, or well, it done depends on the preference of the people who are going to eat the steaks. There are different preferences, and it’s best to know how to cook at the different levels of steak doneness. Organize Bake Sale – All about cooking and other food-related ideas. Setting Table – Tips and steps in doing things at home. Grill Review – All about cooking and other cooking tips and ideas. Outdoor Grill – All about cooking and other food-related topics. Roast Pork Recipe – All about cooking and other food-related activities. Ham and Sweet Potato – All about cooking and other food-related stuff. I’d like everyone reading this article to consider the danger of “under-coooked” steak. Are rare and medium rare steaks really REALLY safe? It was mentioned in the article that “bacteria develop in the exposed sides of the meat”. While this is quite true, it was not mentioned however that the insides of the meat also has bacteria growing in them. They are called “anaerobic bacteria” since they don’t require oxygen to survive. Hence, they can proliferate INSIDE the steak. Anaerobic bacteria are hard to kill. Thus, we need to cook our stakes at the right temperature — 145F or higher. It’s better to be cautious and safe, rather than to deal with food poisoning. Is there other degree of cooking steaks besides rare, medium rare and well done? There is what we call blue rare or very rare. It is when the steak is cooked very quick. The outside is grilled but the inside is barely cooked. There are some people who preferred raw steaks as well. Another degree is the medium cooked when the middle of the steak is cooked and there is pink around the center. Other degrees of cooking steaks are medium well done and over-cooked. There are some other styles of cooking steaks in each part of the world. Take the chicago-style steak in North America as an example. Yummy! I like it when I am served steaks with perfect grill marks. I also love it if it is well done. The way to do this is to position your steak at a 45 degree angle to your griller. If it is being cooked well done which is about 15 minutes on both sides, one the first side make sure to cook it at about 3 to 4 minutes. Allow to sear in the juices then turn the steak the other way at a 45 degree angle and leave to cook for another 3 to 4 minutes. Do the same procedure on the other side and you’ll get the perfect diamond-shaped grill marks on your steak. I am a bad cook, but I appreciate a well-cooked steak. My favorite is my grandma’s beef steak! She taught me the different kinds of beef steak. 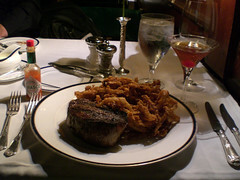 There is the New York Strip (what she usually cooks and what we restaurants usually serve), the Porterhouse (a large kind of beef steak, a combination of New York Strip and tender fillet), the Rib Eye, the T-bone (because of the T-shaped bone in the center), Top Sirloin (the juiciest of all) and the Tenderloin. I am hoping to the different kinds of beef steak someday! A tip in preparing steaks is always be ready to prepare different types of “doneness.” It is important to have different types ready, most especially in gatherings, congregation or just a simple get together. One person may prefer rare steaks while others like medium rare or well done. Martha Stewart suggested in her morning tv show to have more rare steaks than others, so that in case a guest asked for a medium rare or well done steak, you can always pop it in the oven for extra few minutes. I prefer my steak to be well-done. Some prefer theirs medium-rare or rare. I want mine to be fully-cooked because I don’t like the taste of raw meat. Yes, well-done steaks are tougher and less juicy, but you can always choose cuts from tender parts such as loin and rib. I like it served American-style: with mashed potatoes and gravy. Maybe some steamed green beans on the side, as well. Eating steak English-style is another option. Like Harry Potter, I would like my steak to be accompanied by baked potatoes and some Yorkshire pudding. I was surprised to know that “overcooked” is included in steak’s level of doneness. But, I don’t think I want to try it. It is charred all over so it will definitely taste bitter! I doubt if the French people invented it. The French barely cook their steaks! They often eat their steaks bloody. Yes! I also agree that people should consider the health hazard in eating undercooked meat. There are certain parasites that dwell in the tissues and muscles of cattle and swine. The ova of these parasites are killed by cooking. However, eating “overcooked” meat gives the risk for cancer due to the tryptophan contained in the burned meat.